1. 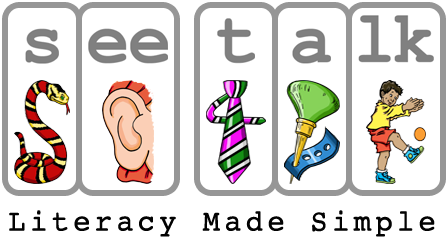 Start with a visual pronunciation key that makes it easy for beginning readers to pronounce familiar words. 2. Advance to handwriting that cues the sounds it stands for and closely resembles the consonant spelling patterns for which English reliably represents. For example the red dot on the "b" is the boot's spur. 3. Learn spelling by letting the brain do the heavy lifting. Reading "seetalk" automatically stocks the brain with the data it needs to manage spelling. The Engelese® "seetalk" learning series makes it easy to get started. We already provide three free iPad® apps on the App Store and soon we will be adding a free PDF booklet for download from this web site. These free offerings can be used to provide a comprehensive set of exercises for both beginning and intermediate readers. Paid programs can then be added for a complete learning experience.